The holidays are here – and so is the holiday stress. While many people look forward to a house full of relatives on Thanksgiving, a White Christmas filled with friendly get-togethers and a New Year celebration even better than the last year, facing the holidays while recovering from a blood clot, or other serious illness or injury, can be downright scary and even extra stressful. But, there are some things you can do to handle holiday stress. I suffered a blood clot in my leg or deep vein thrombosis (DVT) and blood clot in my lung or pulmonary embolism (PE) at the beginning of summer, but I was still unprepared when the holidays rolled around that very first year. To be honest, the whole season from November to January filled me with dread as soon as the Halloween candy was gone. I did not expect to feel any anxiety around the holidays because after all, I never had before. Yet, about a week before Thanksgiving I was suddenly filled with dread for the plans I had made and an overpowering grief that somehow the holidays would never be quite like I remembered them because I, in fact, was a different person than I remembered. All rationale flew out the window with the last of the fall leaves and as the winter chill settled in and enveloped the world outside, my feelings about the impending festivities were also cold. I wanted nothing to do with the holidays because I clearly could not handle them anymore. I certainly did not want to be around anyone at the holidays, especially myself. Everything was a chore, overwhelming and it seemed like I couldn’t trust myself to interact normally with people. It was a fear I had never experienced before and I had no idea how to handle my feelings. Since then a couple of seasons have gone by, and I have started to enjoy the holidays – and myself – again. It hasn’t been an easy process and it has taken me some time to adapt to the way things are now. I noticed that most of my holiday anxiety comes from stress I unnecessarily put on myself. Maybe before my blood clots I could handle that stress without a second thought, but now I have to take careful steps to take care of myself and not let the holiday hustle, and in turn my own well-being, get out of hand. 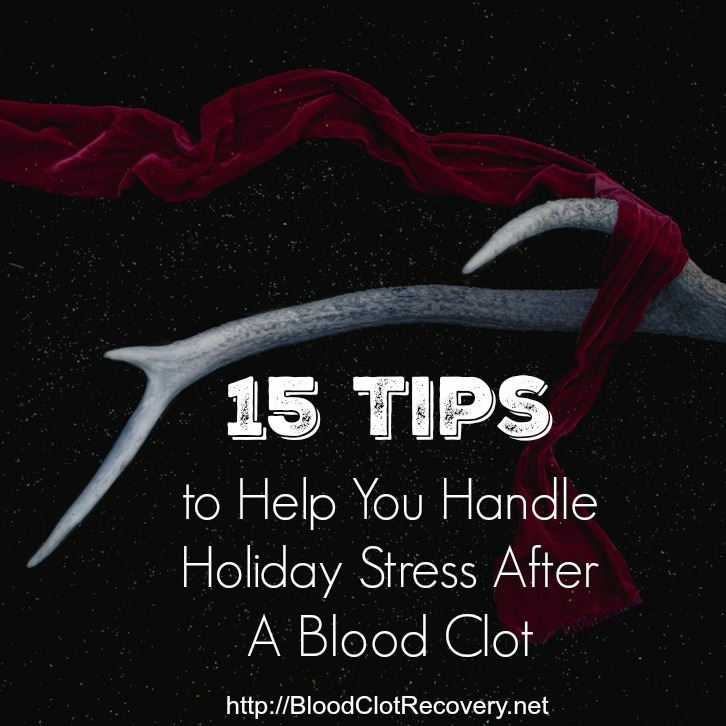 Here are 15 tips to help you reduce and manage holiday stress after a blood clot (or other serious illness). Take time for yourself. The holidays are without doubt some of the busiest times of the year and they are filled with spending time with friends, loved ones and even colleagues. During the season, it is important to also take time for and spend time with just yourself. Do something positive that does not involve someone else, unless it is a close friend of family member you want there. Go for a walk, watch a movie, read a book or take a bubble bath. Whatever you want to do – whether it be alone or with someone special – just do it and do it more than once or twice. I like to go for a walk in the park with my husband and dogs or read a book by myself in the evening. I make a plan to be home from events by ten or eleven at night, just to make sure I have some reading time. Don’t feel pressure to buy a gift if you are facing financial hardship. You can still do something to let someone know you are thinking about them during the holidays, but it doesn’t have to cost a lot of money. For example, you can handwrite a letter or card letting them know how much you appreciate them, write them a pending invite to a home-cooked dinner (for after the holidays and when you are feeling better), make them a CD of their favorite songs or bake a special treat. Pinterest has no shortage of affordable craft ideas for those who like to make things and being crafty is also creative and relaxing. It feels good to make something that makes someone feel special, some would argue even more so than buying a gift from the store. Set your boundaries – and stick to them. It’s easy to want to do everything for everybody, especially when in the spirit of selflessness and giving. It is the holidays, right? True, but you also need to take care of yourself first. If you’re not comfortable driving three hours to get to your favorite cousin’s Christmas party – don’t. Call instead to see if you can arrange a visit at a later date or drop-in on via Facetime or Skype. If you’re not in a position to plan the company holiday potluck – don’t. Instead offer to help find someone who can take your place. If you don’t want to talk about how you are feeling – don’t. Instead stick to a single phrase and use it often, “I’m doing the best I can right now, it’s good to spend time with friends. How have you been?” Set your boundaries in the beginning and don’t lose site of them. Agree to something you can do – and delegate the rest. Something about the holidays makes as want to be and do everything we can be and do and then some. It can be hard to stop doing all of the things that once came very easily. If you usually coordinate your child’s holiday party at school you can say, “I would love to be involved with setting up for the party, but I am going to need some extra help this year. What other parents can I call for back-up?” Then call them. Do you usually organize your friend gift exchange? This year, call on your Bestie to stand in until you’re feeling better. You don’t have to do it all yourself, unless you take it all on. Just like you, people want to help out and you might even find they jump at the chance to take on an extra roll this year. Do less. Do less. Do less. You know the old saying, less is more? Well, it’s true, especially when recovering from a blood clot. And doing less does not mean doing nothing. Take some stuffing off the proverbial plate and take a break. You can always get back to your regular holiday routine as you start to feel better and only if you want to. Enjoy yourself. Do not let rules rule your holiday, either. Yes, I enjoy a glass of wine or two with dinner and eat as many green beans as I can (I will even enjoy cranberry sauce). If you have concerns about your diet or what you can or can’t do, talk to your doctor before the holidays are here about what is acceptable for your treatment plan. If you want to go ice skating, find out if you can wear a helmet, if needed. If you want to take time to stroll the neighborhood to view Christmas lights, plan a light day ahead of time or make plans to have someone drive you through the streets. Do something you love this holiday season. Take time to be grateful. Being thankful can be hard, especially when it feels like you don’t have a lot to be thankful for. I assure you, you do. I find gratefulness in small things, and sometimes those are the only things, like a pretty sunset or an extra half hour of sleep. Once you take time to be grateful for the small things, you might start noticing some bigger things like the opportunity to celebrate another holiday. Communicate with your loved ones, family and friends – face to face. It’s really easy to get wrapped up in text messaging, Facebook and phone calls, more so than I would like to admit sometimes. This holiday season (and maybe even after it), try talking to your loved ones about your needs in an actual conversation, with eye contact. Let them know how you are feeling, what you are struggling with and where you could use a little extra help. It will not only help you to feel more relaxed and less pressure, but good communication fosters better relationships and friendships between us all. Let someone know if you need to sit down, stand up or cut your shopping trip shorter than usual. If you need an afternoon nap, speak up during holiday planning and push that party back an hour or two. Make your needs known ahead of time. For others, who are not someone you want to share details with, it’s none of their business how you are feeling or what limitations you are facing. You are not obligated to tell all just because someone asks you. Stick to your routine. Change is hard for a lot of people to deal with, myself included and the holidays tend to bring about a lot of change. It is very important to stick to your daily routine as much as possible. Make sure you take your medication on time, move around if you are going to be sitting for long periods, remain consistent in your diet and hydrate with water regularly. If you read the paper every morning, continue doing that. If you have a cup of tea before bed, still do so even though you were out a little later. Stick to your routine as much as you can. Get out of the house. It’s really hard to be stuck in the house all the time, especially when recovering from a serious illness or injury. Make it a point to get out at least a few times over the next couple of months, even if it is difficult for you. Maybe you decide to go to one holiday party or meet a close friend for cheesecake and coffee. Get out, enjoy the scenery. You don’t have to be gone long and it doesn’t have to be complicated. You could visit a book store, tour a light display near you or drop off a pumpkin pie to your neighbor. Abandon your old customs, especially if you are lonely or depressed. A lot of my sadness around the holidays came from the fact that they aren’t the same as they used to be. Whether it be from illness, loss of a loved one or drastic change in living and financial conditions, sometimes things just can’t go back to the way they were. If that’s the case, change what you do for the holidays. If you always put up a six-foot-high Christmas tree, but can’t this year, put up a smaller tree in a new place with new decorations. If you always had dinner at Mom’s, but she’s not here anymore, make one of her dishes and bring it to Thanksgiving dinner at someone else’s house. Make a new tradition that you may or may not continue – it could get you through for a short time or become one of your favorite additions to your holiday customs when things return to normal. Listen to music. Music (preferably in the form of Marcus Mumford of Mumford & Sons) has saved me more than once from an emotional breakdown, yelling at someone or total wreckage of my entire day. And research from the University of Maryland has shown music can relax blood vessels and decrease blood flow so if you’re feeling anxious, hit play on your favorite song. Take your headphones with you to that party or dinner and if you’re feeling the holiday stress, excuse yourself to listen to your favorite song (I’ve hidden in the bathroom with iTunes more than once). Or, even if you’re not headed out, listen to some Christmas jams (or any jam) to lighten your mood throughout the day. I promise, it makes a difference. Think positive (and laugh while you’re at it). Surviving the holidays is hard, there is not doubt about that, but don’t be too hard on yourself. I believe nothing was ever accomplished with a bad attitude alone. If you can say something positive to yourself about the holidays like, “Hey, I didn’t have to do dishes by myself this year so I can spend more time with the kids,” or “Thank goodness Aunty Mary was able to make the pies so I can have more time to prepare the turkey,” it’s far more rewarding than focusing on the things that made you unhappy about your situation. Even better, if you can laugh about the forgotten whipped cream or fact that the tree wasn’t plugged in for the big lighting, you’re one step ahead of being positive. Be patient with yourself. A lot of these things are easier said than done, especially in the beginning. The important part is acknowledging your holidays may change, either temporarily or permanently, and that does not mean you cannot enjoy them. Happy holidays, friends. May your days be merry, bright and full of gratitude for the small things in life. Reader Writes In: What’s your number one holiday stress reducing tip? Ever since you’ve had your blood clot, you’ve been feeling a little down. Maybe you don’t enjoy the activities you once did (either because you can’t do them or don’t feel up to it), you feel alone, are easily discouraged, emotionally charged and cry or react at the drop of a hat – literally (don’t worry, I cried for several hours over spilling spaghetti sauce in the kitchen once shortly after my PE). Maybe you feel hopeless, like no one cares and even wonder if life’s going to be like this from now on, why not give up? It hurts to move, get up, lie down or even breathe. No wonder you’re depressed when you spell it all out, right? Dealing with depression after a blood clot is not uncommon, yet, it is uncommonly talked about. Experiencing a DVT or PE, brings a lot to cope with, both physically and emotionally. 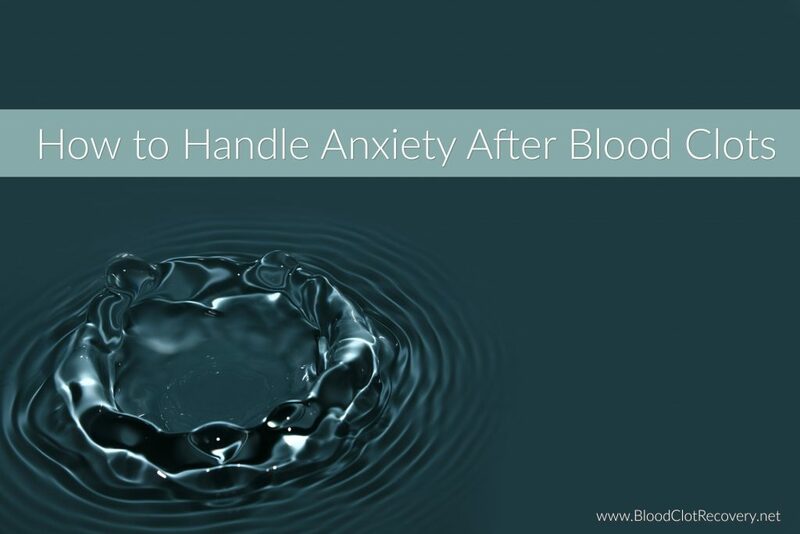 Clot Connect, an organization seeking to increase knowledge of blood clots, clotting disorders and anticoagulation by providing education and support resources for patients and health care professionals states, “It is normal to feel shock, anxiety and fear following the diagnosis of a blood clot” on their FAQ page. Let that sink it for a moment before reading on. You are normal for feeling this way. If you are feeling depressed, anxious, scared or unsure about all that has happened to you during and since your DVT and/or PE, here are my top tips for dealing with depression. Remember you are not alone. Blood clots are a common medical condition. It is estimated that 900,000 people in the United States develop DVT and PE each year [Source]. Talk to your doctor. He or she may be able to direct you to other resources or provide anti-anxiety or anti-depressants. Even if you do not think your primary physician will understand your concerns about depression, still inform him or her about your feelings. It may also be beneficial to seek out a referral to a counselor or psychologist as an additional support for what you are going through. Do not be afraid to ask for help! Understand post-thrombotic syndrome and do what you can to prevent it. One of the long-term, and potentially upsetting, effects of DVT is post-thrombotic syndrome (PTS) and it is not in your head. Find out more about PTS, including the emotional effects and how to help prevent it. Seek out a support group. 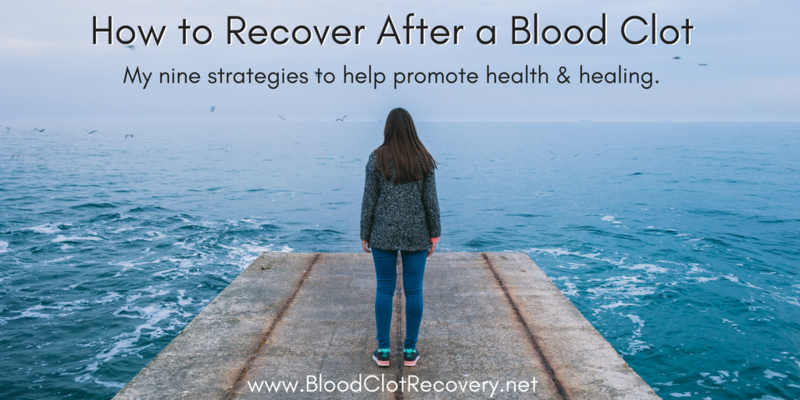 Finding support is important when dealing with recovery from a blood clot. While some in-person support groups do exist (ask your doctor if there are any near you), they are rare. You can join BCRN’s private support group on Facebook. Also, visit here to find even more support groups. Learn about your condition. What you went through was a significant and even life-changing event. Learning about what happened to you through reading, relating to others and talking to your doctor and others can help you to feel empowered, calm and knowledgeable about what did happen and what your recovery might entail. Don’t know where to start? The list of resources on the left-hand column of this page is a great place! Know that your condition is treatable and manageable. Be confident in your treatment plan by discussing it with your doctor and any trusted friends or family members you may have. Connect with other survivors who have been where you are now. Write your feelings down. A daily or weekly journal of how you felt, what you did, progress you made or challenges you faced can help you to see how far you really have come over time. Writing, even if it is only a few sentences a day to express a particular emotion or event, is very helpful in releasing your feelings and giving value to them. Consider writing down and sharing your entire blood clot story. What you feel is important and sometimes it just feels good to get it out of your head. Have patience with yourself. Recovery takes a long time and it’s not easy. Know what you are okay, you are doing what you can and you are right where you need to be. Something as simple as walking to the bathroom or making a sandwich is enough for one day. 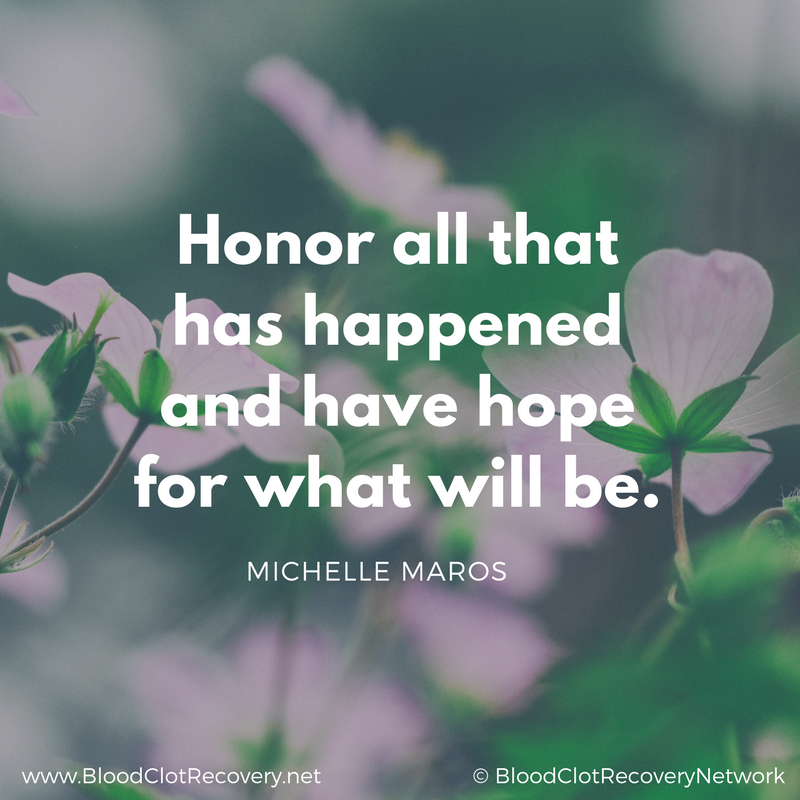 If you are struggling to get back to where you were pre-blood clot physically and emotionally, remember it takes time and it is different for everyone. Be kind to yourself. You are loved. You have been though a lot and your body and mind have been faced with a catastrophic incident. It is okay to feel the way you do from time to time and it will take some time to adjust. Please remember, if you are facing thoughts of self-harm or suicide, please call 911 or seek other help (such as a hospital emergency room or doctor’s care) immediately. If you are thinking of suicide, The National Suicide Prevention Lifeline is a 24-hour, toll-free, confidential suicide prevention hotline available to anyone in suicidal crisis or emotional distress. Remember, even if it seems hopeless, suicide is not the answer. Share your story. Have you felt depressed since your blood clot? How have you dealt with depression?